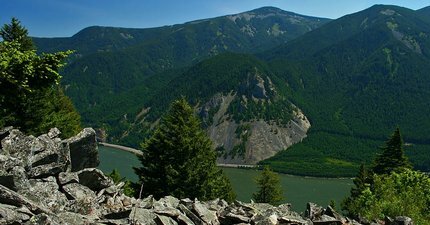 This is one of the least known hikes in the Gorge yet if offers spectacular views for such a short hike. Parking at the Trail Head is limited, so park in the designated area shown on the map. Its only a short walk to the trail itself. 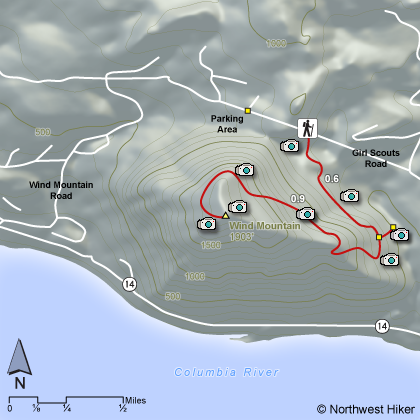 The hike starts out rather steep and often challenges the hiker with intense grades. However, due to the short length of the hike, it is only a moderate in difficulty. And the reward is great. This is the one hike on this website that has archaeological components. On the top of Wind Mountain are Native American formations created by young people during their Spirit Quest. Great care must be taken not to disturb these ruins.